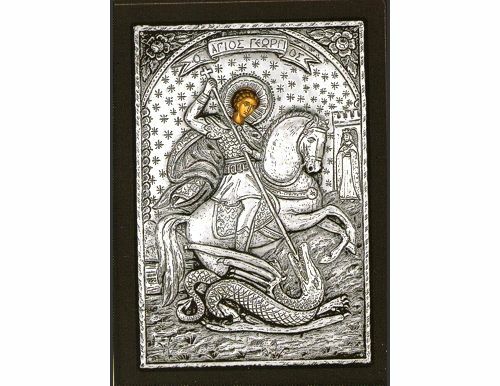 An exquisite silver Greek Orthodox icon of St. George killing the Dragon. 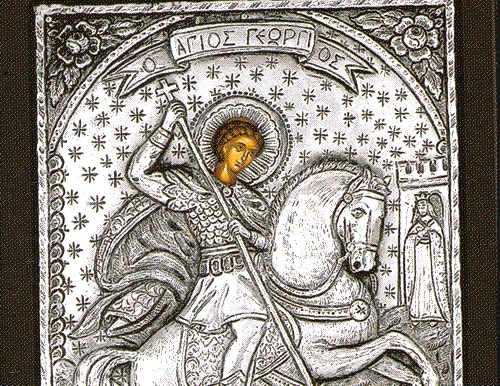 St. George was a Christian Roman soldier killed under Diocletian at the beginning of the fourth century. Though he was born in Cappadocia, his mother was from Palestine, and thus he is a particular favorite of many Palestinian Christians. He is also the patron saint of Moscow, Georgia, and England, amongst other places. The Church commemorates George on April 23, and the translation of his relics on November 3.